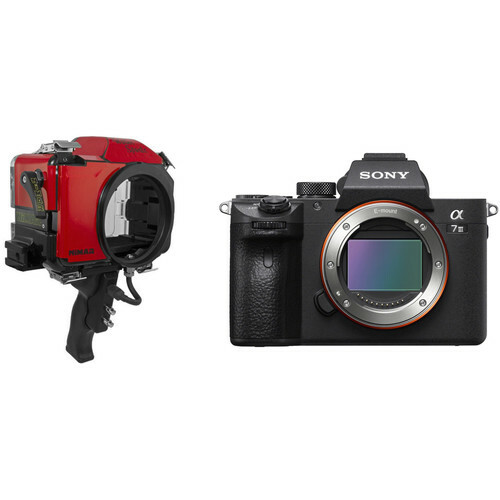 Capture striking images and video of aquatic sports and the underwater world with the Nimar Base Water Sports Housing for Sony a7III, a7RIII & a9 cameras. The pistol grip is equipped with push-button focus and shutter controls; other controls must be preset or set to Auto mode before the camera is put into the housing. The housing features a depth rating of 98' for shooting well below the surface or in shallower depths for activities such as surfing or water-skiing. Built for durability, the Water Sports Housing is constructed from corrosion-resistant red polycarbonate that's clear in the back to allow you to monitor the O-ring seal and the camera. The built-in moisture alarm will alert you in unlikely event of a breach in the seal, giving you time to get out of the water to prevent damage to your camera and lens. The enclosure ships without a required lens port and accepts interchangeable ports for various lenses. For lens and port compatibility, see the Port Chart. Additionally, an optional sync connector can be installed to allow for the attachment of an external strobe.